*Note - Early termination of contracts will result in an Early Termination Fee of 75% of the remaining contract. *Includes: Caller ID, Call Waiting ID, Voice Mail Basic, Call Forwarding Busy and Call Forwarding No Answer. Calling Features and/or Long Distance may be added to Basic Plans at their regular prices. Managed Wi-Fi installation Feee is $19.99 with minimum 24 month contract. A maximum of 8 devices can be used. For residential and small business use only. Do you wish to port your number(s)? 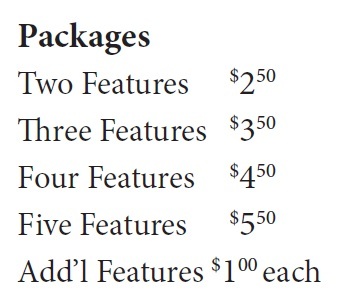 You will be automatically added to the following package. Minutes are anytime/anywhere in the U.S. The Maintenance Protection Plan is an optional offering that provides protection from the costs associated with repairs to station wires and jacks. The plan is offered to residential customers only. In some cases you may not be able to receive the speeds listed below due to the length of the loop or other issues. If we are unable to serve you at the speed requested a customer service representative will contact you. NOTE: Early termination of contracts will result in an Early Termination Fee of 75% of the remaining contract. Managed Wi-Fi Installation Fee is $19.99. A maximum of 8 devices can be used. Please check here if you have a hearing or speech disability or condition and that this disability/limitation prevents or limits your ability to communicate over voice networks.